It's Organic Juicing Made Simple! 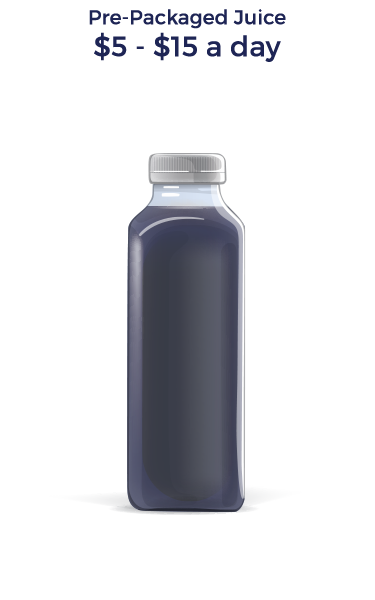 Now there's a simple shortcut -- Purity's OJC® -- Organic Juice Cleanse™ - Blueberry Detox. It's Organic Juicing Made Simple! Unleash the power of nature with OJC® and take your health to the next level. 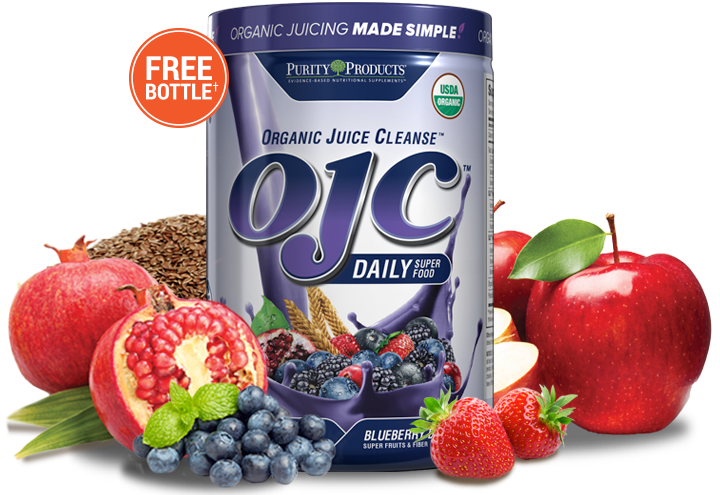 OJC® - Organic Juice Cleanse™ is... Juicing Without the Hassle! 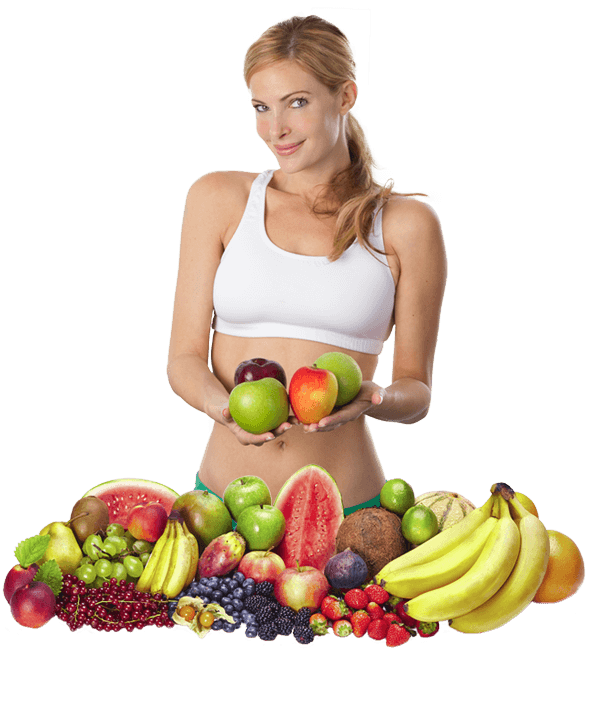 ARE YOU GETTING ENOUGH FRUITS AND FIBER? It's no secret that organic juicing can help you take control of your health, energy, vitality and well-being. But let’s face it—juicing every day is a hefty commitment. Consider all the shopping, storing, washing, blending and cleaning that goes into juicing your own fresh produce. 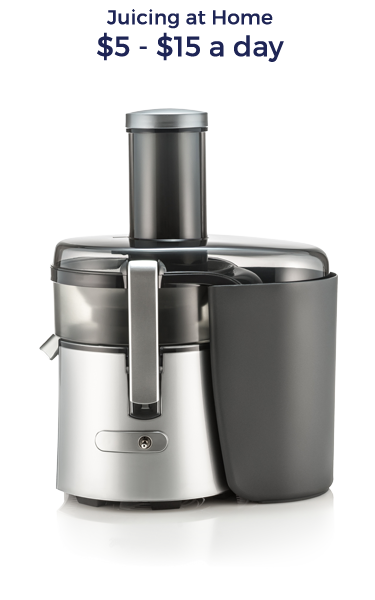 Not to mention the expense, the time, and space required when you own your own juicer. That’s why we invented our Organic Juice Cleanse™ (OJC®): a nutrient-rich, powdered fruits and berries beverage that is a convenient alternative to expensive fresh-pressed juice. The first of its kind, our Organic Juice Cleanse™ is packed with delicious fruits, berries and organic fiber. We start with fresh, ripe organic produce in every hue. 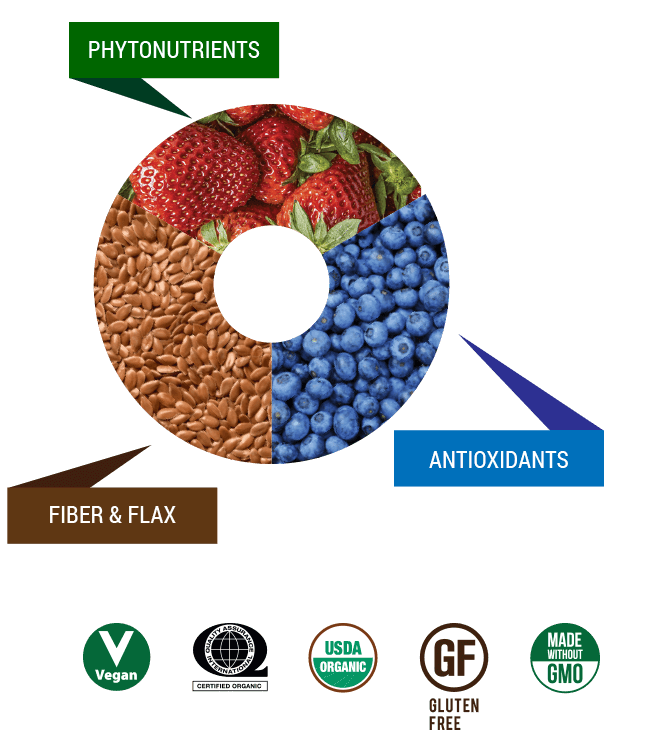 We freeze-dry the ingredients, locking in beneficial phytonutrients, antioxidants, and fiber, and then grind them into a fine powder. Only 25 calories per serving, our Organic Juice Cleanse™ is a simple way to incorporate juicing into your routine and help fill in those gaping potholes in your diet. Everybody likes to save money. 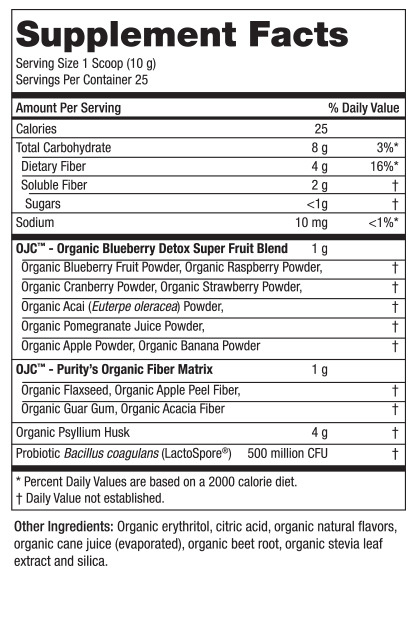 The daily cost of OJC®: Organic Juice Cleanse™ is up to 90% less than that of pre packaged cold pressed juices. Other juice cleanses can cost as much as $250 for just a 5 day supply. OJC® packs in organic goodness, quality and value into every scoop. Your Simple Shortcut. Today You Can Get Started for Free†! 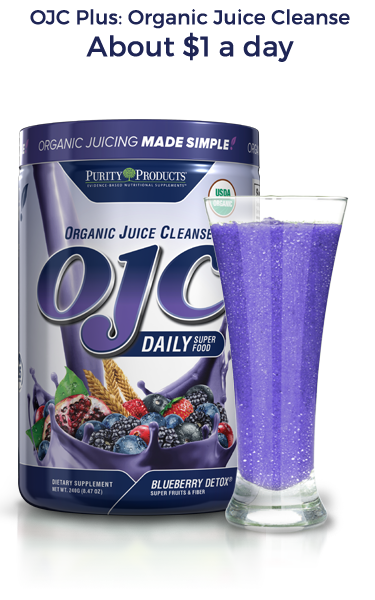 Convenient: Just add one 10 gram scoop (about one heaping tablespoon) of OJC® to your beverage of choice, and you’re ready to get juicing. Affordable: Your first sample bottle is free! And if you like it, The Organic Juice Cleanse™ costs about a dollar a day — that’s 1/10th of the cost of traditional juicing or buying it at the store. 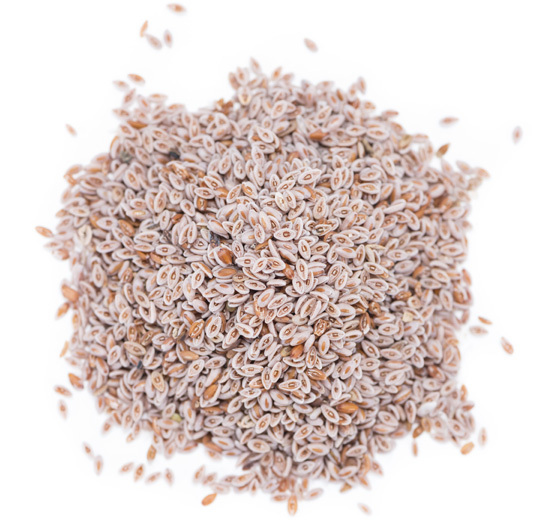 Diets low in saturated fat and cholesterol that include 7 grams of soluble fiber per day from psyllium husk may reduce the risk of heart disease. 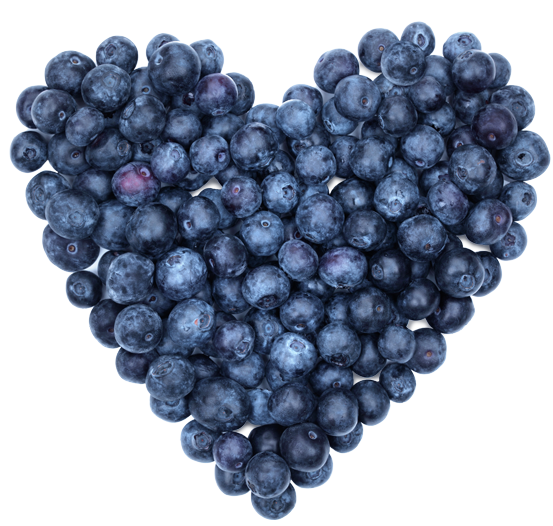 One serving of OJC® - Blueberry Detox provides 4 grams of this soluble fiber. You're going to love the convenience of the Organic Juice Cleanse™. If you’re ready to experience energy, vitality, healthy digestive and immune function, and a newfound sense of wellness, try a FREE 25 day supply of our Organic Juice Cleanse™ today. Click below to get started. Pay just $4.95 for shipping and get your free bottle + free shaker cup. If you have questions or prefer to order your free bottle by phone simply call us 24/7. Our representatives are ready to help you: 1-866-205-6947. † - $4.95 shipping applies. By accepting the free bottle offer (25-day supply) you will be enrolled in our Super Saver program, locking in the low Super Saver price of just $46.95 per bottle (22% off the retail price). As a Super Saver you will receive three bottles every 90 days - each bottle is a 1-month supply. Your first delivery of 3 bottles will arrive about 2-3 weeks after you receive your FREE bottle, so you don't have to worry about missing a day. Purity Products will charge the credit card used today for your 3 bottle shipments. Of course, you can customize your order at any time by changing the frequency, date of shipment and number of bottles shipped out to you. If you want to discontinue the automatic shipment, call us within the first 15 days and you will never even be billed.